You’ve probably heard in recent years of front load washing machines with buzz surrounding it stating that they’re more energy efficient than traditional top load washers. This may seem like an odd statement to you – how could moving the door possibly make the machine itself more efficient? When a washing machine is deemed high efficiency, that doesn’t mean that it runs faster, but that is uses fewer resources and draws 50 per cent less water and energy than the conventional, top-loading style of washer. 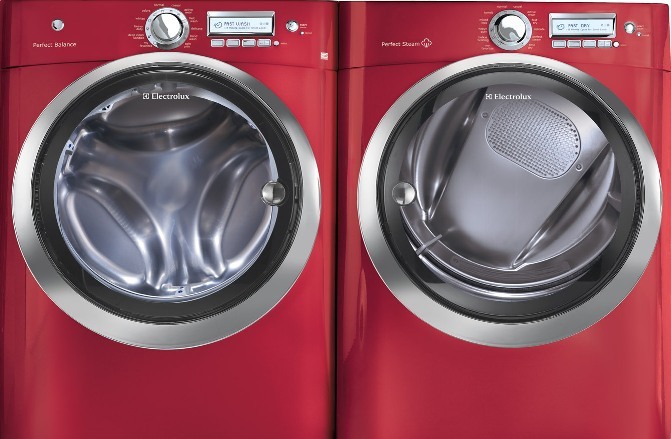 Through fills and wash motions, a higher efficiency washer can also sense how big or small a laundry load is and what fabric types are in it, which enables the washer to optimize the water level and temperature. This means that laundry items will be saturated but won’t be completely submerged in water. Not to worry, though, as this doesn’t mean your clothes will be any less clean. Using less water, a high efficiency washing machine is able to still effectively clean the load with a unique impeller motion that moves items through the water instead of just simply agitating; thus, it uses the movement of clothes against each other to aid in the cleaning process. The load is also moved from the outside of the barrel to the middle so that items come up into the centre and down on the outside edges. Because less water is used, high efficiency washers require a high efficiency (HE) detergent that produces low suds and better facilitates the rinsing process. These washers also spin at a higher speed than conventional washers and therefore extract more water from your clothes, which in turn reduces drying time. For more information on energy efficient appliances, visit www.scratchanddent.ca or stop by the store at 407 Gage Avenue, Unit #4 in Kitchener. A friendly staff member would be happy to help you or take your questions at 519-743-3623.